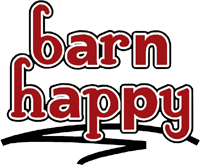 Barn Happy has a variety of products in addition to the variety of gift baskets. Some of these products include unique flavors of coffee, lipgloss, handmade mugs, books, candles, snacks, and more! These products are made locally in Iowa, are one-of-a-kind items that make great gifts for families and friends! Upstairs at Barn Happy, there are many antiques and up-cycled treasures to be discovered in this vintage haymow.